France, on the other hand, has embraced the health benefits of raw milk. 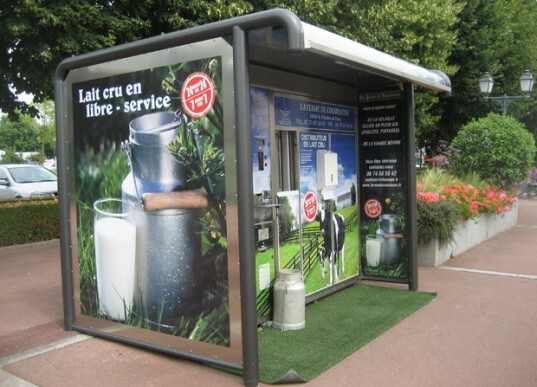 There, innovative dairy farmer Michel Cantaloube has created a raw milk vending machine (see photo below). The vending machine is a tastefully-designed kiosk that blends right into the urban setting, allowing it to be set up on a street corner on a French town or even a major metropolitan area. Customers can purchase whatever quantity of raw milk they wish, and unlike in the United States, they don't even have to go through the bizarre paperwork of owning a "cow share." Back in Los Angeles, raw dairy farmer Sharon Palmer has been slapped with 38 felony counts drummed up by the county, which has a rogue DA office running a campaign of personal revenge against dairy farmers. Driven into near-bankruptcy by the fines and legal fees, Palmer has been unable to repay farm investors as planned, so when her repayments fell behind, the county charged her with financial fraud. Keep in mind that when MF Global's Jon Corzine stole billions of dollars from investors, he was never even charged with a crime. When Wall Street giants like Goldman Sachs went broke making bad beds with other people's money, the United States government gave them a trillion-dollar bailout! But when a small, organic raw milk farmer in California runs into financial trouble caused by the state itself, they get charged with 38 felony counts of fraud. So in France, raw milk is happily sold in vending machines on street corners, but in California -- a state which used to represent a healthy, happy lifestyle -- raw milk advocates are targeted by the state as criminals, then subjected to personal vengeance campaigns run by the DA's office. France = the "healthy food nation" of raw milk and red wine. California = the "torture state" of total government brutality and oppression of farmers, along with the torture of raw dairy advocates.